Choosing the right content management system (CMS) for your specific business needs can be a daunting task to say the least. The good news, is that now more than ever there are literally dozens of viable and robust options available at your disposal. However, the flip side of this is that navigating the sea of information can quite easily give anyone some serious sensory overload. We’ve brought you a list of four of the most popular, mainstream content management systems with the hope that you’ll gain some insight into the various platforms in order to make the best decision for your specific business needs. This is by no means an exhaustive list — so you won’t find dozens of options available to peruse. What you will find is insightful and focused information on the pros and cons of some of the most popular platforms out there that account for the majority of the CMS market. Wix has been on the scene for quite some time now and has upped their advertising game, showcasing the various celebrity and influential individuals who use the platform. Wix markets primarily to the creative millennial entrepreneur type (just check out their advertising images on their website). So if you’re a travel vlogger, fashion blogger, or someone just starting out and looking for an easy user-friendly platform, then this is definitely the best option for you. Wix offers five package prices ranging from $5/month – $25/month. The basic plan allows you to connect your domain and comes with 1GB of bandwidth and 500MB of storage. The second-tier offers double the bandwidth (2GB), increased storage (3GB), a free domain and removal of Wix ads. Users can upgrade to their most popular third-tier plan for $14/month and get unlimited bandwidth, increased storage (10GB), removal of Wix ads, a $300 ad voucher as well as a site booster and form builder app. The e-Commerce option is the fourth-tier package and offers upgraded storage (20GB) and an online store and the fifth tier option (the VIP Package) offers “VIP Support” as well as Priority Response and a Professional Site Review in addition to the aforementioned benefits. 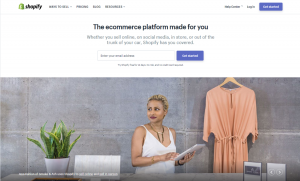 Wix advertises as a free website builder, however anyone vaguely familiar with content management systems knows that the catch is most of the important features will require upgrades. Also worth mentioning is that the site booster, form builder, free domain and ad vouchers aren’t included if you decide to move forward with a monthly subscription, so the costs will be additional. This platform is great for individuals without extensive design knowledge. It’s ADI (artificial design interface) which includes professional text, images and more makes it a cinch for individuals don’t have to have extensive coding knowledge or skills. Additionally, Wix boasts the “most innovative drag and drop website builder”, and over 500 designer-made templates including the option of video backgrounds, parallax scrolling (take a look at Firewatch’s website for an insane example) and animation. For those looking for more advanced coding capabilities, these again are available with an upgrade which according to the platform includes “a website builder, reliable web hosting, top security and the best SEO” in addition to a “dedicated Support Team”. While the platform boasts itself as “SEO compatible”, the truth is it isn’t the most ideal option available on the market if this is one of your primary strategic goals. 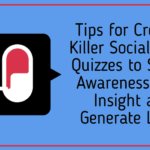 Some have complained that it doesn’t allow you to really knock it out of the park with SEO because while there are designated areas for SEO best practices, , “it’s just not ideal to get your traffic to your site through Google searches”. This could be perhaps due to fact that Wix is a self-described website “for developers, by developers” – so they really haven’t knocked it out of the park with making SEO easy-peasy and user-friendly much like competitors such as WordPress (their Yoast SEO plug-in is divine). Wix is hands-down the most cost-effective and straightforward starter option. However, users should be aware that you could very easily start paying as much as you would for a more premium platform only to get stuck with a less superior one with the same price tag. WordPress is hands down the most popular and widely used content management platform due to its versatility and endless integrations and plug-ins. The biggest question we get asked is, Why WordPress? WordPress has nearly 60% of the market share amongst other CMS-based websites. 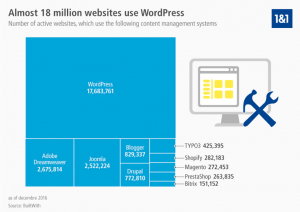 WordPress has continued to grow its reputable brand year after year and is recognized as one of the most flexible tools for website management. With over 75 million websites using WordPress, we believe that WordPress is the clear go-to web development tool. Visioneer’s Hosted WordPress Solution allows our clients the ability to set up their own website, import an existing WordPress site within minutes or have our amazing team of designers do the work for you! WordPress offers endless design options available at your fingertips, mobile optimization and analytics. They’re also extremely SEO friendly due to the fact that they’re so user-friendly, their designs are simple and work to enhance the user experience and they are easily crawlable by search engines. WordPress can be tricky for individuals who don’t have time or interest to commit to learning a bit of code. We offer a Monthly Maintenance packages as well as website live chat, built-in appointment scheduling widget, and even a review generation services to help improve your online reputation. Here are a few more technical details about our hosting solutions. Within conventional wordpress installation’s security flaws are present due to the fact that it makes it more of an ideal target for hackers. However with Visioneer’s Managed WordPress Solution we have partnered with Google to offer a top notch secure product which gives our customers piece of mind that their business website is protected. Shopify is pretty much the go-to platform for e-commerce companies and businesses who rely heavily on conversions. It’s designed specifically for this purpose and as a result, it excels where other platforms fail due to the fact that it has a more focused target demographic and niche. This platform excels at getting inside the head of the e-commerce minded individual in so many ways it’s kind of ridiculous. They also offer convenient opportunities to capitalize on sales from other shops with their drop-ship program and options. Many users will appreciate that they’re able to add products from other companies to their shop and take a commission without having to deal with the hassle of shipping and handling. Think of it like a step up from your Etsy shop. There’s no extensive design or coding skill or knowledge necessary and it offers users the ability to accept credit cards instantly with Shopify payments and seamlessly sell on additional platforms such as Pinterest and/or Amazon. Shopify shipping also saves you time and money, increasing your conversions by giving you access to more accelerated checkouts. If you’re looking to branch out of your Etsy shop and build a more personalized and professional brand and you have a solid track record of sales, then this is the place for you. If you don’t have all your ducks in a row and you’re not geared up and ready to go with your selling, then there are other options available that are more suitable for your needs. To be honest with you, there really aren’t a boatload of cons when it comes to the Shopify platform. A few individuals have complained that the 14-day trial is less than ideal and the fact that once it’s over you’re immediately locked out and forced to upgrade is a bit much. 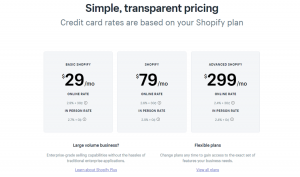 However, you can have access to monthly plan options and to be honest, I think that Shopify is well aware that they have a superior product in many ways (especially for e-commerce businesses) and as a result, they aren’t pressed to be competitive with their pricing. All in all, the platform features a robust set of offerings and is an ideal option for anyone with a business heavily based on sales and numbers. However, creatives that are often drawn to other platforms such as Wix or Squarespace should know that if they’re just looking to just grab onto a platform where they can simply throw up a portfolio of for exposure, then this is definitely not the most ideal option. 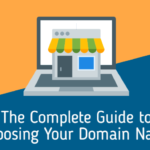 However, if you’re putting up a platform to get direct conversions such as an artist looking to increase sales or an e-commerce company, then Shopify is going to be your best bet on this list. 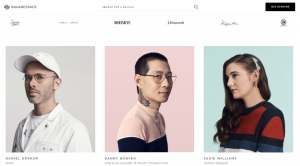 Squarespace is heavy into advertising and mainly markets their services to artists and creative entrepreneur types. Squarespace is the superior platform if you’re company is in an industry focused on visuals and aesthetic. This is where they excel. Squarespace is one of those platforms that does contemporary minimalism best. Users also can rest easy that they won’t feel as bombarded with an endless sea of design and template options as often is the case with so many other platforms. However, what they can count on is a robust, visually engaging platform that will give your business the competitive edge and absolutely ooze professionalism. As the platform boasts, users get the chance to “look like an expert right from the start” and with the visually stunning design layouts they back up their statements 100%. To be honest, there aren’t many cons to this visually geared platform, especially if you’re coming from the creative industry. However, if you hit more along the lines of a type-A personality with a design background, then chances are you may have an issue with the lack of options available in comparison to other platforms. But hey — some find this ideal (such as myself) and it really just depends on your cup of tea. Finding the perfect content management system to fit your specific business needs can often feel like finding a needle in a haystack. With so many CMS options available of varying capabilities, specializations and prices, companies more than ever are finding the ability to navigate the ever-expanding sea of information at their fingertips an essential habit to master. This list is by no means an exhaustive end-all-be-all of course and there are dozens of viable competitors not listed within this article such as Drupal, Joomla! 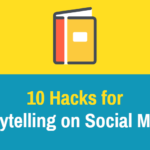 and more that may very well work better with your strategic goals. The important concept to take away from this is that there are pros and cons to every CMS and the only way that you’re going to be able to really understand which is the best for your particular needs is by using a strategic combination of research and trial and error. Hopefully, we’ve at the very least enlightened you a bit on the pros and cons and have left you feeling more informed on the subject matter than you were when you stopped by. We would love the opportunity to chat with you about our Managed WordPress Solution. 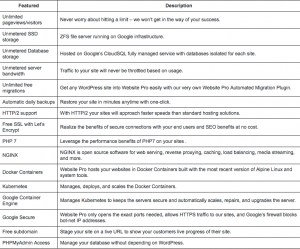 Have any other suggestions for awesome content management systems not listed in this article? We’d love to hear your thoughts!